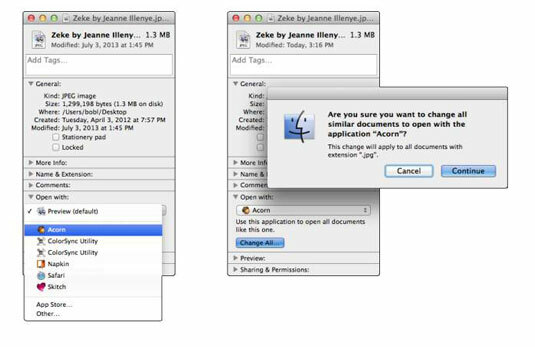 OS X Mavericks lets you specify the application in which you want to open a document in the future when you double-click it. More than that, you can specify that you want all documents of that type to open with the specified application. “Where is this magic bullet hidden?” you ask. Right there in the file’s Info window. Let’s choose Acorn. Now Acorn opens when you open this file (instead of the default application, Preview). 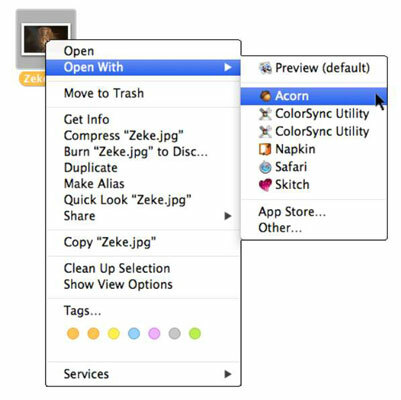 (Optional) If you click the Change All button at the bottom of the Open With pane, you make Acorn the new default application for all .jpg files that would otherwise be opened in Preview. If you were to double-click an MP3 file, for example, the file usually would open in iTunes (and, by default, would be copied into your iTunes Library). If you frequently want to audition (listen to) MP3 files with QuickTime Player, so they’re not automatically added to your iTunes music library. Dragging the MP3 file onto QuickTime Player’s icon in the Applications folder or its Dock icon (if it’s in the Dock) solves this conundrum quickly and easily. One last thing: If all you want to do is open a file with an application other than its default (and not change anything for the future), but the easiest way is to right-click the file and choose another app from the pop-up menu. You can also change the default application to open this file by pressing Option after you right-click the file, and the Open With command will magically transform into Always Open With. Alas, you can’t change the default application for all files of this type; for that you’ll have to visit the Info window.